I was on my way to Japan. 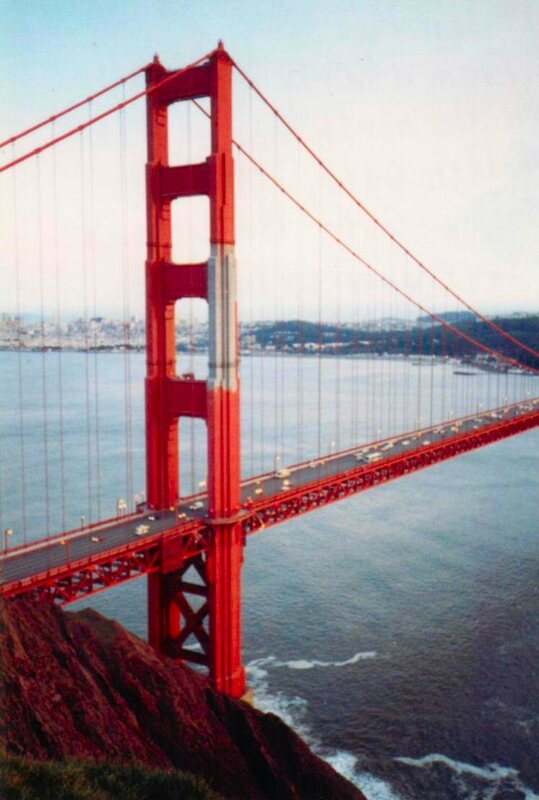 The Air Force gave me two choices for my port-of-call; St. Louis, a three hour drive from my house, or San Francisco. I chose the latter. Seeing San Francisco had been a life-long dream. I didn’t want to fly;rather, I took a Greyhound bus from Evansville. Three days before I left, I received a letter from Karen. Something horrible had happend to her at work. I was so shocked I didn't mention it to anyone, but I knew I had to get to Japan-fast. The trip was very tiring, 60 hours on a bus, but I made friends with a cute 23 year old named Barbara(click name for photo) who was on her way to Eugene, Oregon to be a reporter. She reminded me of Shirley Temple with breasts. We talked for over a day, with very little rest. The rest of the people on the bus were uninteresting and smelled. Barbara transferred at Salt Lake City, so we walked around the town and ate breakfast at McDonalds before she disappeared forever. 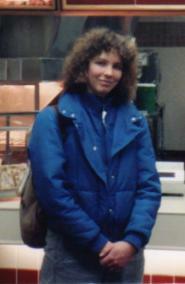 I arrived in San Francisco, at midnight as five cops were fighting a junkie outside the bus station on Market Street. I thought I was in a dream. I was sooo excited. The cops took us aside and questioned all of the bus passengers as we sat in the bus station. Then I met Jim…he’d grown up in Oakland, and he was friendly, so he and I wandered around to all of the bad parts of town from midnight to 6am, talking to prostitutes, homosexuals, and drug dealers. We stumbled onto the filming of the movie Presidio. I talked to the camera crew but didn't see Sean Connery anywhere. In the morning, it began raining heavily. Jim and I hoofed it to 11 companies until we found someone who would rent us a car. Then we cruised the bay all day, visiting Candlestick Park, the projects in Oakland…everything except the Golden Gate Bridge. I went through three rolls of film and Jim took me places I would have never visited on my own. Unfortunately, Jim turned out to be a drug abuser. He was getting high in bathrooms, and driving me around. He was a scary guy. We visited his aunt and uncle and I told them he needed help. They talked to him about it...but we left. I didn’t quite know how to get rid of him. He asked me to drop him off at a corner to visit a friend and he borrowed my camera. As soon as he got to the corner, I blasted out of there. 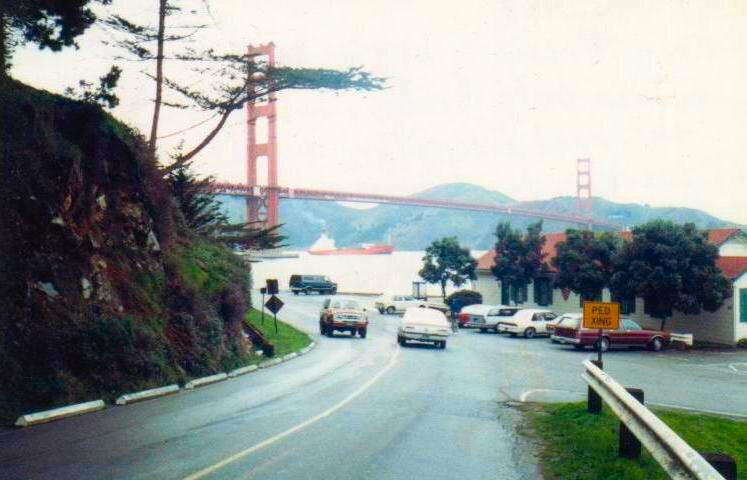 I had very little money, no idea where I was, driving a strange car at night…and it was rush hour in San Francisco!!! It took two hours to get from Oakland to the bus station in San Francisco. I grabbed my things from the locker, threw Jim's things into the street, and made a run for Presidio, which took another two hours. I hadn’t eaten in 36 hours or slept in over a day and was extremely tired. As I drove, I kept seeing Barbara...she was the last friendly face I'd seen, and it was comforting.